I love the idea of thinking beyond the singular farm to a network of farms and farm communities, and even further to the watersheds that supply the farm's water, the wild places that supply the farm's natural pollinators and beneficial insects. It's also intriguing to apply this thinking to urban and suburban farming, to examine the network of gardens and farms, and other elements that interact as larger whole. 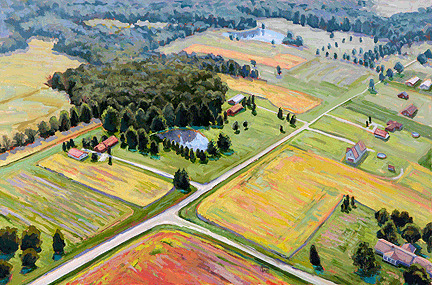 A few years ago, I interviewed Matt Sheafer of Sandhill Organics, the 45-acre organic farm at Prairie Crossing, a planned community one-hour outside Chicago, and he cited this idea of network as what was ideal for him about suburban farming. The way he saw it, he was close enough to agricultural communities to benefit from fuel and seed cooperatives, and other rural networks, but also close enough to a city that his kids could go to great schools and visit museums on the weekend. What would we 'conserve', or recognize, as part of a holistic urban/suburban agriculture plan? The resevoirs that supply irrigation water, the farmer's markets where produce is sold and the education programs that create the social capital to support these agrarian efforts would be just a few on my list. Leave a comment with elements you'd add!